Diabetes does not discriminate age. It can start at an early age or appear later in life. It may become a struggle for you and your child so let me help you by giving you the basics of type 1 diabetes. Juvenile diabetes is the manifestation of diabetes in children. This happens when a child’s pancreas is not able to produce sufficient amount of insulin required by the body. Because of this, the child will have to inject insulin into his or her system to correct this deficiency. I know that this is hard to take. Imagine that your little one cannot enjoy eating candies or ice cream just like the other children because of his or her dietary restrictions. Aside from this controlled diet, your child will also have to endure insulin injections and a close monitoring of his or her blood sugar. I’m afraid that the exact reason why juvenile diabetes happens in the first place is not clearly understood. It can be hereditary or set off by viruses. However, one thing is for sure. This condition occurs because your child’s immune system attacks its pancreas thus destroying its ability to produce insulin. Pick lean cuts of meats instead of those rich in fat. Those who have diabetes are prone to getting heart disease. Therefore, a diet low in fat is appropriate to help your child avoid this disease. You can grill hamburgers stuffed with leafy greens, low-fat cheese, and mustard. This way, your child can experience eating regular “junk” without actually eating junk food. We all know that vegetables are important in a diabetic meal. However, they can be your child’s worst nightmare. To make them eat veggies, you can add them into other dishes or change the way you make them. 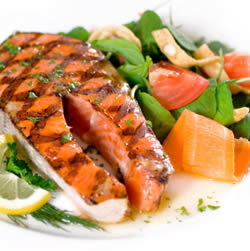 Seafood is a great addition to any child’s diabetic diet. Seafood does not contain excessive sugar plus it is low in fat. It is also important that your child is aware of his or her condition. Let him or her know by including the child in planning of the diabetes diet, buying the food’s ingredients, and teaching him or her the benefits of eating healthy. Encourage your child to take up sports or pursue other physical activities such as Karate or Ballet. Having this condition does not mean that he or she should be deprived of the normal stuff that other kids do. After all, they are kids. Mark has been writing extensively about diabetic diet food and diabetic meal planning on the American diabetic diet site. 1,800 Calorie Diabetic Diet – What Is It?